Egyptian President Mohamed Mursi has sent troops to Suez, in eastern Egypt, after eight people died in clashes between protesters and state security police. 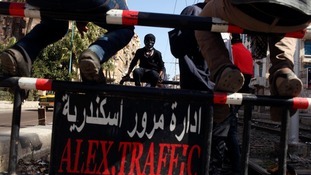 Hundreds of protesters in Egypt's second largest city, Alexandria, blocked roads and tramways around one of the main squares in the city. Scuffles broke out between tram drivers and a number of protester blocking the route, according to local media.